The scapula (shoulder blade) is the largest bone of the shoulder complex and has the greatest number of muscles attached to it. These muscles both stabilise the arm to the body and move the arm around in space. All these muscles act at the same time sometimes and oppose each other at other times, but work together like a well trained team to allow the arm to move in space. If any of these muscles are not working in the right way at the right time this leads to a break in the rhythmic motion of the scapula. This is known as a scapula ' dysrhythmia '. This leads to apparent 'winging' of the scapula. Winging of the scapula is a surprisingly common physical sign, but because it is often asymptomatic it receives little attention. However, symptoms of pain, weakness, or cosmetic deformity may demand attention. 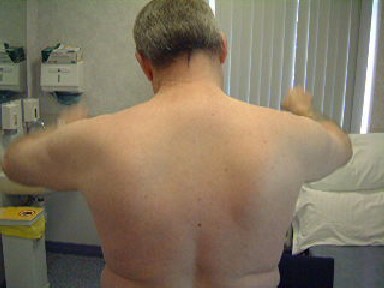 Winging is also a useful sign to suggest underlying problems with the shoulder. When one talks about winging of the scapula, true winging is due to serratus anterior muscle dysfunction. This is an uncommon condition and may arise from traumatic injury to the nerve supplying the serratus anterior muscle, the long thoracic nerve; or due to damage to the nerve from pressure lesions or a neuritis (inflammation of the nerve). The long thoracic nerve follows a long an tortuous course from the neck to the serratus anterior muscle. It is prone to injury as it is much more vulnerable than many of the other nerves of the brachial plexus. The test for identifying a long thoracic nerve injury is the 'serratus wall test'. The patient is asked to face a wall, standing about two feet from the wall and then push against the wall with flat palms at waist level. Nerve conduction studies and EMG test of the long thoracic nerve, serratus anterior muscle and other muscles of the shoulder blade are beneficial to diagnose and quantify the degree of nerve and muscle damage. The tests are also useful to assess and follow recovery of the nerve. The treatment will depend on the cause and severity of the injury. Exploration and decompression of the nerve can be performed, where it gets trapped or damaged at the scalene muscles in the neck. For more advanced cases, pectoralis muscle transfer can be performed. The trapezius muscle is a large muscle above your scapula which lifts and rotates your scapula. It is the muscle you use to shrug your shoulders. Isolated loss of trapezius function is extremely rare and may occur after radical neck surgery (for tumours), where the nerve supplying trapezius may be damaged (the spinal accessory nerve). Many people can manage with loss of trapezius function, but some have weakness and difficulty with manual and overhead activities. If the diagnosis is made early, then surgical reconstruction of within 20 months of the injury the nerve or nerve release (neurolysis) should be considered [Teboul. JBJS. 2004]. For for those diagnosed later a modified Eden-Lange muscle transfer procedure may be indicated [Romero & Gerber. JBJS. 2003]. Muscular dystrophies, most commonly fascioscapulohumeral dystrophy (FSHD), are the main cause of weakness of all the scapula stabilising muscles. Click here for more detail. The coracoclavicular ligaments suspend the scapula from the clavicle and the acromioclavicular joint is the only joint linking the scapula to the rest of the body. Therefore dislocation of the acromioclavicular joint or a fracture of the outer third of the clavicle, with rupture of the coracoclavicular ligaments, leads to an abnormal scapula rhythm and apparent scapula winging with overhead manouevers. This is usually not painful and usually only affects overhead workers and athletes. Another rare cause is the 'scapulothoracic dissociation', described by Rockwood & Matsen in 1990. The scapula is wrenched from the body in violent trauma leading to fracture of the clavicle and soft tissues around the clavicle. This is one of the commonest causes of scapula dysrythmia (and winging). Recurrent dislocations of the shoulder leads to dysfunction of the muscles that move and support the shoulder complex and scapula. The more frequent the dislocations and the less trauma involved in causing the dislocations, the worse the scapula dysryrhmia (winging). An essential part of treating shoulder instability (recurrent dislocations) is treating the scapula dysrythmia. This is done by an experienced physiotherapist in association with a shoulder surgeon. 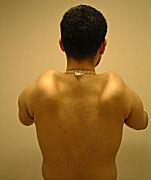 This is another common cause of econdary winging and dysrhythmia of the scapula. Any painful condition of the shoulder will lead to abnormal movements of the entire shoulder complex. Reduced movement at the glenohumeral joint will lead to more compenatory movement at the scapula. Most of the nerves supplying the stabilising muscles of the scapula arise from the Brachial Plexus. The Brachial Plexus is a bundle of nerves running from the neck to the arm. It carries the nerve supply for the muscles of the arm and shoulder. Sometimes a major accident can affect the muscles of the shoulder more than the arm and lead to winging. When there is no trauma, a condition known as Parsonage-Turner syndrome (Brachial Neuritis) can lead to weakness of the scapula muscles.